If you pay attention to our Hotshots contest, you’ll notice several photos by Shawn Schwengler. 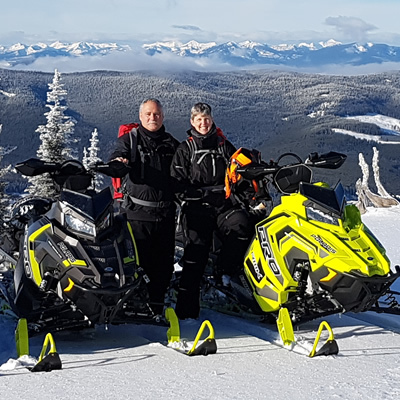 The 42-year-old from Medicine Hat, Alberta, was chasing freshies between Crowsnest Pass, Alberta, and Fernie, B.C., all winter. It wasn’t his scenic mountain shots that caught our judges’ attention, however. 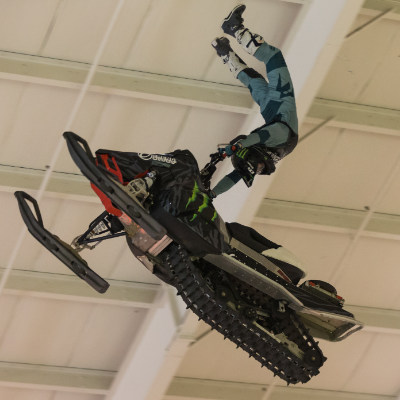 It was a photo of his son sending it on a custom-built Yamaha SnoSport. Below, we learn more Schwengler and his unique project sled. 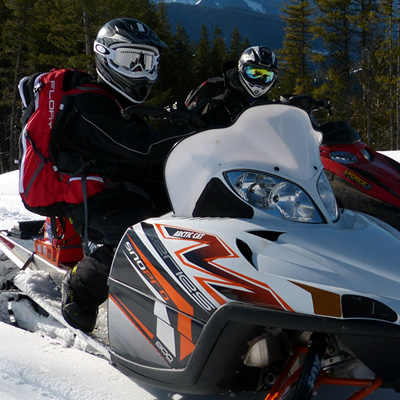 How long have you been riding sleds? I have been riding sleds since I could walk. A 1975 Sno-Jet SST was what we had growing up. I have been riding in the mountains for 25 years. I currently ride a 2017 Yamaha Sidewinder Turbo 162, and I love it. My dad was always into sleds and it was just a natural thing to do for fun. I am very passionate about the sport and think it’s one of Canada’s greatest pastimes. These days, I typically ride the Fernie area. I think out of all the places I’ve ridden—various places in Montana, Idaho, Alberta and British Columbia—when the snow is good, York Creek south of Coleman, Alberta, is one of my favourite tree riding areas. 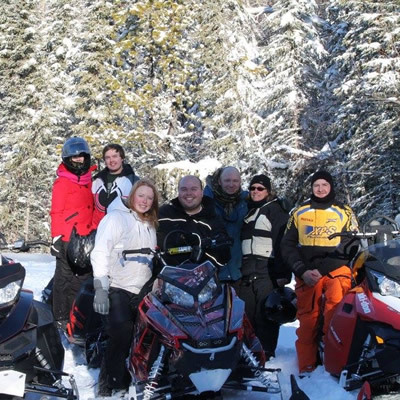 What does your group do to stay safe when riding in the mountains? I grew up in an era when thinking about avalanche safety wasn’t like it is today. Most of us in our group have avalanche training, wear a beacon, probe, shovels, airbags and all the survival gear to spend the night. We all have some kind of hand-held satellite communication. Along with the training and gear, we spend time reading terrain and making sure we don’t get caught in a terrain trap. Also, we watch the avalanche bulletins daily. This Yamaha SnoSport I built for the kids. We went to my brother’s farm and let all the kids have fun on a spring day. They decided they wanted to do some jumping, so we built a ramp and got some great photos. My son was 12 years old in the picture and my daughter was nine. The Yamaha SnoSport 125-cc is a 1990. 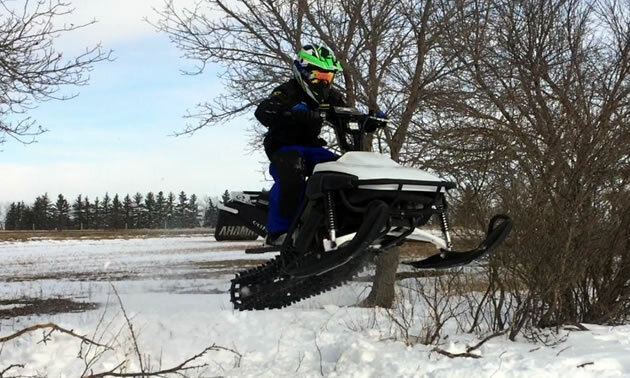 It’s the big brother to the SnoScoot 80-cc. I found a broken SnoSport and went to work modifying it to make it work better in deeper snow. I installed a hydraulic brake, a 121 x 1 ¼ track, a custom suspension and custom-built running boards and tunnel. I installed an LED headlight and custom handlebars. This sled took a few hours to build.